The brewery at 5th & DuPont Streets, known for much of its duration as the Bavarian Brewery, was the last of “the Big Three” to be constructed. A brewery would stand on the northeast corner of that block for nearly three quarters of a century. Carl Specht, who was born in Saxony, immigrated to America and operated breweries in Havre de Grace, Maryland and Philadelphia before arriving in Wilmington in the mid-1870s. In 1877, Specht opened a weiss beer brewery and bottling plant at 7th and DuPont streets. 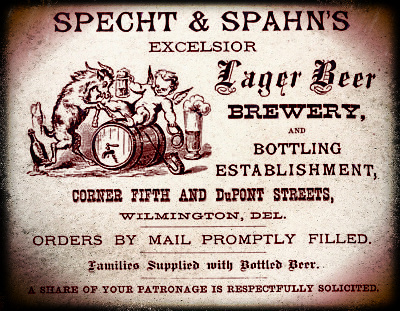 In 1880, Specht and his son-in-law, Adam Spahn, purchased the property on the northeast corner of 5th and DuPont and constructed a brewery and bottling establishment. The brewery, named the Excelsior Lager Beer Brewery, supplied its beer in kegs to saloons and also delivered directly to Wilmington homes. By 1886, the Specht & Spahn partnership encountered insurmountable legal and financial issues and went out of business. Specht skipped town and was later discovered to have been operating breweries under assumed names and in Towanda, PA; Dunshore, PA; Buffalo, NY; and Canal Fulton, OH. Spahn remained in the beer bottling business in Wilmington until his retirement 20 years later. A brewing company called the Excelsior Brewing Company, headed by Evan Rice as president and B. Frank Townsend as secretary/treasurer, took control of the brewery after Specht & Spahn’s closure. Unfortunately, the business lasted little more than a year before closing in 1888. The brewery sat idle until it was purchased in early 1890 by John A. Lengel, a native of Baden-Württemberg. Prior to his arrival in Wilmington, Lengel had operated a weiss and lager beer brewery at 1534 Germantown Avenue in Philadelphia. Lengel renamed the brewery the Bavarian Brewery and made large capital investments over the next several years to increase production and improve quality. In 1894, the company was incorporated as the Bavarian Brewery Company, Inc. with Lengel serving as president. The firm added a large five-story brew house and stock house in 1897 to increase capacity to 20,000 barrels. The Bavarian produced its flagship Bavarian lager beer and porter, as well as a seasonal bock in the spring, which was sold directly to saloons and was made available for purchase in bottles from bottling companies and liquor retailers throughout the Delmarva Peninsula. The Bavarian Brewing Company’s success made them a prime target for a buy-out. 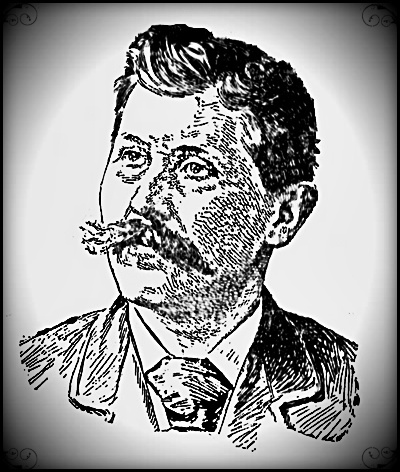 In 1898, the firm sold out to a group from investors from Washington, DC, headed by brewmaster Carl H. Eisenmenger. He had worked in that capacity at both the Jacob Ruppert Brewery in New York and the Christian Heurich Brewing Company in Washington, DC. Lengel stayed on as vice-president with the new Bavarian Brewing Company, Inc. for a couple of years, until his retirement. Under Eisenmenger’s experienced guidance, the Bavarian Brewing Company increased its share of the local market with its lager beer and porter. The brewery’s specialties were its Bavarian light and Maerzen dark lagers. which was available at hotels, restaurants, saloons and bottlers statewide and in Chester County, Pennsylvania. Poor health forced Eisenmenger’s retirement in 1908. He died one year later. Bavarian re-organized with Eisenmenger’s wife, Magdalene, taking over as company president, nephew John Hehl as vice-president and son Carl Herman Eisenmenger as a director, among others. Long-time Bavarian employee, Jacob Steiger, assumed the role of brewmaster. In 1911, Magdalene Eisenmenger stepped aside and Herman became company president. Over the next several years, the brewing company greatly expanded its physical plant, adding a new four-story annex containing a cooper shop, stock room and boiler house. Additionally, a new two-story office building, bottling house and stock house were added, the latter of which doubled the brewery’s capacity. Its Bavarian, Luxburger, and Green Label were popular beers in New Castle and Chester Counties, until the implementation of National Prohibition forced the end of their production. 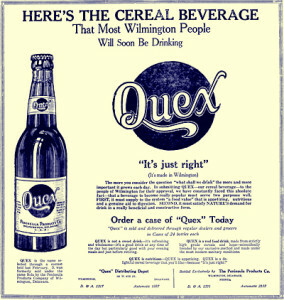 Eisenmenger, who understood that Prohibition would likely soon be a reality, had began brewing a ‘near beer’ cereal beverage as early as 1918. In 1919, the Bavarian Brewing Company officially changed its name to the Peninsula Products Company, Inc. The company continued with its Quex ‘near beer’ product and added a line of soft drinks. After an initial surge in business, the venture ultimately failed and, in 1925, Peninsula closed its doors for good. Eisenmenger, who maintained ownership of the 5th & DuPont property, rented the complex to other soft drink companies and businesses. He temporarily withdrew from the beverage industry but would return again to revive brewing operations after repeal of the 18th Amendment.